Much of the news surrounding the housing market is about climbing prices and continued decreases in inventory on a year-over-year basis. Although prices have been rising steadily, we are only now beginning to reach pre-recession price levels on a national basis, and that’s not the rule for all homes and communities. If demand stays strong, unemployment rates continue to dwindle and wages keep consumer confidence high, the market should remain active and interesting. It is a lucrative time to sell a home, and it would appear that it will remain that way for the time being. Houses that show well and are priced correctly have been selling quickly, often at higher prices than asking. Thus far, buyers are proving to be resilient in 2017, keeping the home-purchasing momentum up even amidst the mounting competition that comes with the annual spring market. In light of the low inventory and affordability situation this year, it was a good surprise to see existing home sales hit a national 10-year high. It isn’t a surprise, however, to see multiple offers on a home within a few days of being on the market. Buyer demand is high and will continue to be for the foreseeable future, so it was also welcome news that builder confidence and housing starts were up as well. Seller activity rose 1.3 percent compared to March 2016. The number of signed purchase agreements declined 3.0 percent, though the number of closed sales rose 8.3 percent. 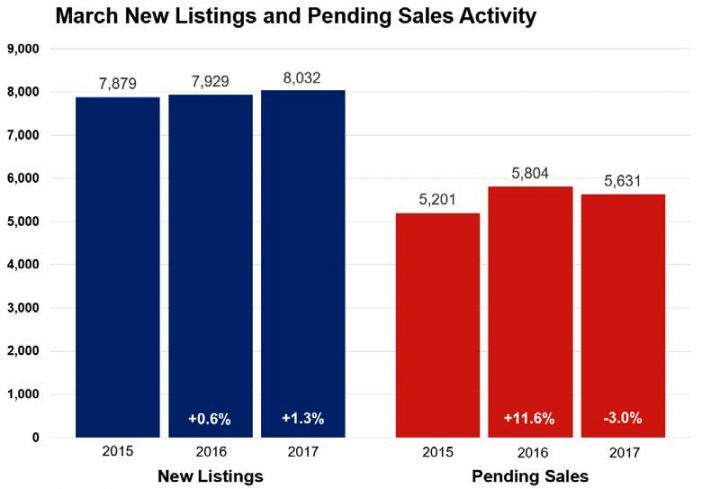 Housing demand has outpaced supply, thus continuing the trend of falling active listings. In March, inventory levels fell about 20.0 percent compared to 2016 levels. Those shopping for homes have 10,213 properties from which to choose in the metro area. Given that figure stands near a 15-year low and demand has reached an 11-year high, affordably-priced homes that are listed often fetch full-price offers or better in record time. These market conditions tend to drive prices higher. The median sales price increased 7.0 percent from last March to $237,500. Multiple offers on attractive, turn-key properties in the most desirable neighborhoods and school districts are common in low inventory environments. Properties also tend to sell quickly and for close to or above list price. Average days on market until sale fell 14.1 percent to 73 days compared to 85 in March 2016. It’s worth noting that the median days on market for March was a brisk 34 days. The average percent of original list price received at sale was 98.1 percent, 1.3 percent higher than last March. Similarly, the median percent of last list price received at sale was 100.0 percent. The Twin Cities has only 2.0 months of housing supply—the lowest March reading since 2003. Generally, five to six months of supply is considered a balanced market where neither buyers nor sellers have a clear advantage. A thriving local economy has been conducive to housing recovery. The most recent national unemployment rate is 4.5 percent, though it’s 4.2 percent locally. The Minneapolis–St. Paul region has a diversified and resilient economy with a talented workforce that’s enabled one of the highest homeownership rates in the country. The average 30-year fixed mortgage rate has declined from 4.3 percent to 4.1 percent lately, still well below a long-term average of about 8.0 percent. Barring any unforeseen events, the Federal Reserve is likely to increase their target federal funds rate at least once more this year. Wage and inventory growth are key to offsetting affordability declines brought on by higher rates.